Coreopsis is one of the mainstays of the perennial garden because its golden yellow composite blossoms brighten the landscape from June until frost, even on the gloomiest days. 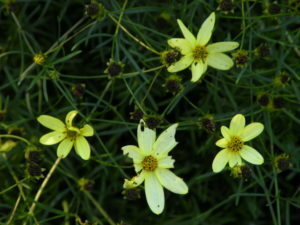 An American native, hardy from zones 3 and 4 to 7 or 9 depending on the species, Coreopsis is usually found at the front of the border because most species grow only one to two feet high. The best known species is Coreopsis verticillata (Thread Leaf Tickseed).. This species has long thread-like foliage which bolsters its ability to withstand drought (less leaf surface through which to lose water). The small single flowers, held on slender stalks, are very floriferous and an installation of five plants can appear to be a small meadow. After the first flush has lost its petals, shear the whole planting by one-third; within three weeks, another flush will appear. Each flush is usually in bloom for three to four weeks. If faithfully sheared on time, I normally have three flushes a year. The cultivar ‘Moonbeam’ was the PPA Perennial of the Year in 1992 and it is still a mainstay of many perennial gardens. 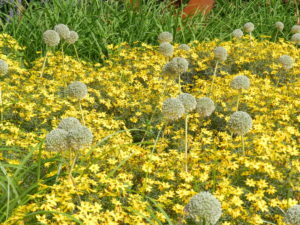 Its clear lemon yellow can be combined with almost any other perennial. ‘Golden Showers’ and ‘Zagreb’ are golden yellow so more care must be taken when working them into a design. ‘Zagreb’ is the shortest of the verticillata cultivars at 8-12” while the other two can be 12-24”. In the past several years, many other cultivars with varying colors have come to market. while many clients say that they hate orange, they often feel differently about apricot or peach. I frequently introduce these people to Coreopsis ‘Sienna Sunset’ or ‘Crème Caramel’, both of which have coppery flowers and grow approximately 18” high. Even newer are some red cultivars, among which are ‘Red Satin’ (a ruby red) and Cruizin ‘Main Street’ (deep rose), both growing to 18”. There is also a bicolor called ‘Route 66’. This 24” tall cultivar is a very strong grower and has almost overpowered my ‘Moonbeam’. The two species, C.grandiflora and C.lanceolata, are virtually indistinguishable and some of the cultivars listed as one or the other are actually hybrids of the two. Their basal leaves are simple while the upper ones are lobed. The flower heads are a bit larger than those of C.verticillata and so are the individual petals. Flowers of this cultivar must be individually deadheaded, very time consuming, to keep it blooming into the fall. If you shear this type, you will be left with unsightly stubs. 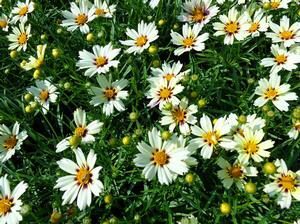 There are several new series of hybrid coreopsis, the foliage of which seems to be mainly C.grandiflora. The greatest asset of these hybrids is the addition of white flowers and more bicolors. The Li’l Bang Series vary in height from 6 to 12” and in color from red/yellow to red to white/maroon. The Big Bang Series will grow 15-20” tall and can be sheared. 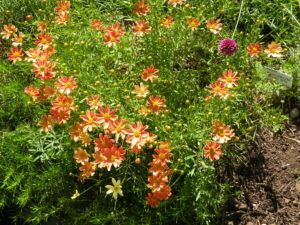 All Coreopsis require full sun and well-drained soil; in fact, once established, it is relatively drought tolerant. Propagation is by division or seed. Coreopsis are an excellent alternative to Rudbeckia when a long-blooming yellow perennial is desired. The color is much easier to work with because it does not have as much orange in it. It combines well with ornamental grasses and perennials that have yellow variegation in their foliage such as Miscanthus sinensis ‘Strictus’ or Lysimachia punctata ‘Alexander’ which also has yellow flowers. 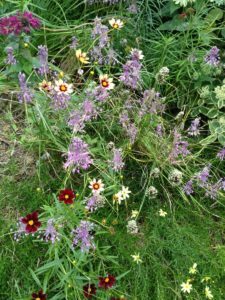 It is an excellent perennial for a border because its length of bloom bridges the periods when other perennials come and go. 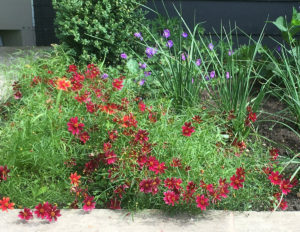 Add Coreopsis to your perennial list and bring cheer to any sunny corner of the landscape.